Today we introduce our new Replay Review Statistics page, tracking instant replay decisions by Umpire, Team, and Type throughout the season. Snapshot of a few features of the UEFL's Replay Stats page. 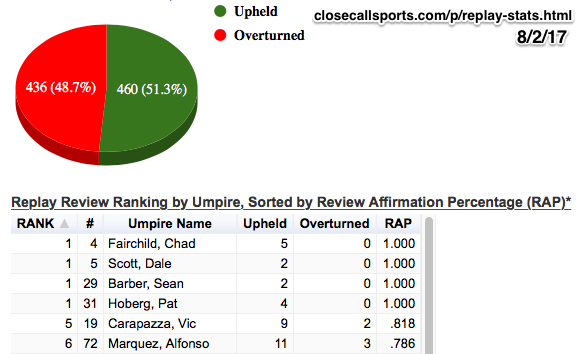 This new product of UEFL's Umpire Sabermetrics contains a Replay Review overview, tables for umpires sorted by Review Affirmation Percentage (may also be sorted by umpire, or number of calls upheld/overturned), teams, and a chart broken down by type of call subject to review. "MLB Umpire Replay Review Statistics and Sabermetrics" is accessible from any page at www.closecallsports.com by clicking the "Replay Stats" link on the navigation bar at the top of the site. For more information, visit the new page here: http://www.closecallsports.com/p/replay-stats.html.